Will Hutchins on his favorite Western shootouts. Once upon a time at “A Gathering of Guns” at the Memphis Film Festival, you’d find us indoors at the Dealer’s Room—signin’, shakin’, schmoozin’. A guy will approach, check-out my 8x10 glossies, and allow as how I don’t look the same. “These pictures are 50 years old, dude!” I’ll reply. Another feller will up to us, his camcorder at the ready, and start shootin’. I’ll get up and say, “Pardner, wanna see my fast draw?” I’ll just stand there. I’ll say, “Wanna see it again?” Well, he’s seen this groaner dozens of times, so I’ll show the Jasper an original Sugarfoot Sugarcured hambone. I’ll say, “Wanna see the second fastest gun in the West?” I’ll proceed to perform a lightnin’ fast draw, in pantomime. “Bang!” I’ll go. I’ll pretend to twirl my pistola, return it holsterside, and stand there with a smug smile. Then I’ll perform a Red Skelton and fall flat on the floor. If the gent keeps shootin’, I’ll crawl under Bab’s skirt. Got my ‘Second fastest’ gag from “Stagecoach”. Duke Wayne, The Ringo Kid, is gunnin’ for them ornery Plummer boys, seekin’ revenge for the murder of his father and brother. Night on Lordsburg’s Main Street. Ringo Kid dives onto the rutted road, firing his carbine. Cut to saloon interior. Gun shots continue. Then, through the swingin’ doors enters one o’ them evil Plummers, Tom Tyler. He ambles up to the bar as if to celebrate the killin’ of the Ringo Kid, and he drops dead. One hot Sunday Daniel Bubbeo came to our house, Limberlost, to interview us for a NEWSDAY article. Thanks to nature’s jumpstart, iced mocha java, I told him more than he cared to know. Daniel asked for my five favorite Westerns. I gave him six. I’m a six-shooter. Later, I thought, “What about my favorite Western shootouts?” Won’t you join me on a memory mosey down gunman’s walk? 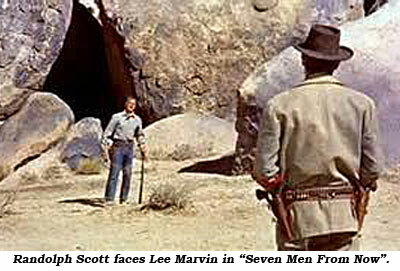 In sort of a masterpiece, “Seven Men From Now”, Randolph Scott, looking not unlike William S. Hart, drills Lee Marvin, the mother of all bad guys. Scott’s too fast, and Marvin dies with a smile of disbelief, as he proves to be a worthy alum of the Don “Red” Barry school of outlandish deadfalls. 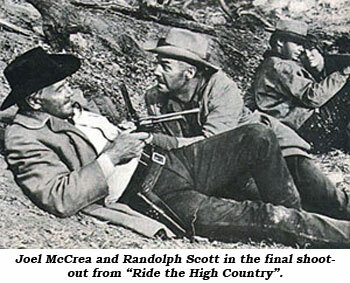 “Ride the High Country”— Randolph Scott and Joel McCrea, aging but ageless, forsake their differences and cowboy up. Scott strays from the straight and narrow, but good buddy McCrea guides him back—guns a’blazin’, their strength is of the strength of 10. They wipe out James Drury and his brutal brothers. Scott takes a bullet, followed by his last gasp. McCrea sighs. It’s too beautiful a day to die. 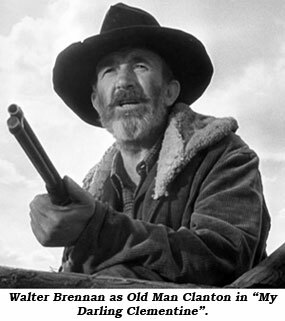 “The Westerner”—Judge Roy Bean (Walter Brennan) buys out the theatre so he can be an audience-of-one to see for the first time the love of his life, Lily Langtry. The curtain goes up, and there stands Gary Cooper. 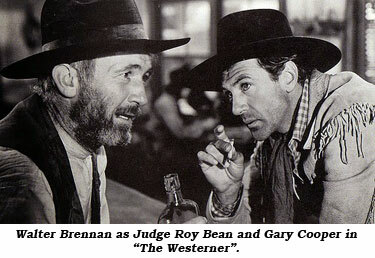 “I’m a’takin’ you in, Judge.” Thus begins one of the strangest shootouts in Westerns lore. Sporadic shots echo throughout the vast, ornate cavern. At last, Cooper takes dead aim and gets one off. Judge Bean whispers that he is winged. Coop picks him up and carries him, in his Confederate uniform, into the Jersey Lily’s dressing room. This is the biggest moment in the Judge’s life—Lily presents him the sweetest smile of his life. Then, her lovely face begins to fade away, and so does the Judge. 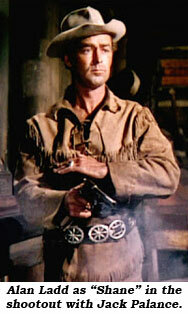 In “Shane” Alan Ladd gives the boy a lesson in fast-draw and shooting. “Joey, the way I’m teaching you is as good as any, and better than most.” Seein’s believin’. Joey and his dog follow Shane to the saloon at night. Ryker: “I’m not dealing with you.” Shane: “You’re dealing with me, Ryker.” Ryker: “I got no quarrel with you, Shane. You walk out now and no hard feelings.” Shane: “You’ve lived too long. Your kind of days are over.” Ryker: “My days? What about yours, gunfighter?” Shane: “The difference is, I know it.” Ryker: “All right. So we’ll all turn in our six-guns to the bartender. We’ll all start hoeing spuds. Is that it?” Shane: “Not quite yet (referring to hired gun Wilson). We haven’t heard from your friend here.” What follows is one of the screen’s great showdowns. “Come back, Shane!” But the wounded warrior keeps riding into the night, into high country. Maybe, he’ll find a place to hang up his gun. Maybe, he’ll find peace. Scene: Saloon in “My Darling Clementine”. Wyatt Earp asks, “Mac, you ever been in love before?” Mac says, “No, I been a bartender all my life.” Soon after, it’s Earp and Co. vs. the four Clantons at the Gunfight at the O.K. Corral. John Ford claimed to have known Wyatt Earp. Claimed the gunfight was shot “exactly the way it had been.” Hmmm! Don’t rightly recollect Doc Holliday gettin’ his that day. No matter. Mr. Ford made his living telling stories—no room in his soul for anyone else’s vision. The problems of these mere mortal cowpokes firing away is dwarfed by the magnificence of Monument Valley, stark white clouds against a dark sky, Joseph P. MacDonald’s camerawork emphasizing Ford’s dynamic diagonals—sparse dialogue, no music, no wasted gunshots, no wasted time—it’s the most poetic gunfight ever filmed. “Duel in the Sun”. Boy meets girl. Boy loses girl. Boy shoots girl, girl shoots boy. Pearl Chavez (Jennifer Jones) is the only gal to bite the lusty dust on my list. Senorita Chavez spends a lotta this sagebrush saga horizontally—on the floor, on the grass, on the dirt, on the bed, on the rocks. Brilliant 3-strip Technicolor, haunting love theme. Whatever happened to haunting love themes? A cast of thousands, and that’s just the horses. The most overwrought Western of all time? “Bizarre! Excessive! Outrageous! Demented!” cried the critics. “Dy-no-mite!” cry I. It holds me spellbound. (Er, no, that’s another Selznick flick.) David O. was tryin’ for “Gone With the Wind II”. Miss Jones was tryin’ awful hard for Oscar II. The really big climax: An unforgiving sun, high in the desert, miles away from the closest honey wagon. Jones and Peck shoot it out—Blam! Blam! Gregory’s a mite stoic. Hard to tell when he’s dead. Awww! There they lie, entwined, his white man’s blood mingled with her half-breed blood. Reckon that’s a message. Camera zooms back, back, back. Their bodies are mere pebbles in the exquisite panorama. Whoa! Do you see what I see? Over on the left, I swear, there’s a huge rock formation in the shape of Abe Lincoln’s head, forlornly looking down on this scene of sorrow. THE END. Instead of a slew of credits, Dimitri Tiomkin gives us rousing exit music.